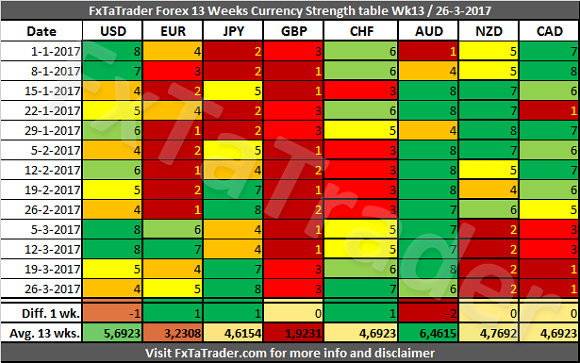 In the Currency Strength table, the JPY was the strongest currency while the CAD was again the weakest. There were a lot of changes last week but with just a difference of 1 point. 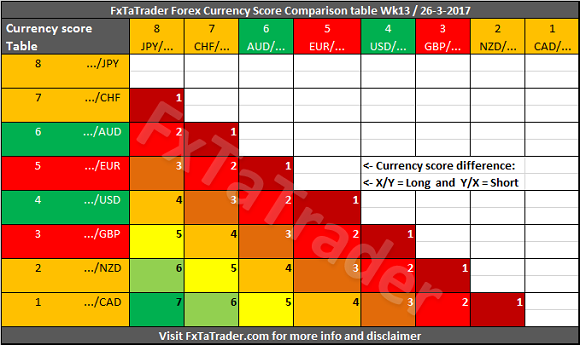 The EUR, JPY, CHF gained all 1 point while the USD and AUD lost 1 point. The other Currencies remained at the same level. When looking at the Average 13 wks. Score the AUD remains the strongest of all while the GBP remains the weakest. The currencies are grouped together around a level which makes clear to what classification they fit best. The NZD and CAD lost a lot of strength in the last 4 weeks. As can be seen the Average 13 wks. Score are very close to the CHF which is a Neutral currency. For that reason, these currencies are now also classified as neutral. The NZD and CAD lost a lot of strength lately and as can be seen in the chart below. For now, these currencies are classified as Neutral currencies. They are both in a dip and there is no sign of bottoming yet. 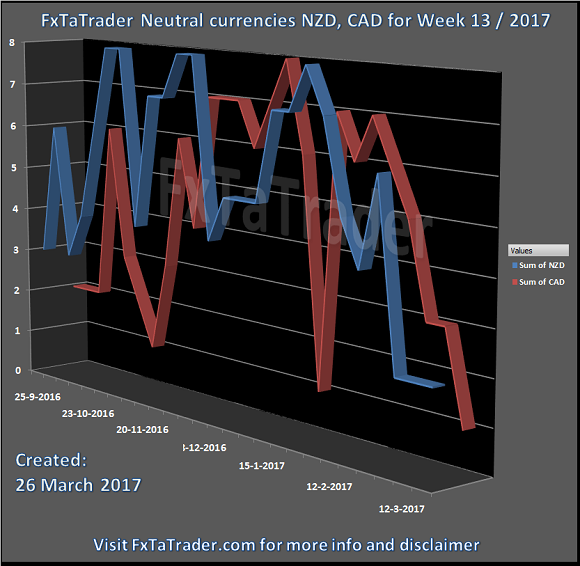 In the last 6 months, the CAD bottomed also in January and October 2016 and the NZD had a few small dips. These currencies remained further strong during the last 6 months. The text "Approved" mentioned in the `Currency score comparison table` has been taken out. The reason is that the information is published once a week and the rates change during the week. The mentioned scores also change and different opportunities may show up during the week. It seems then better to provide only the currency Score difference. Depending on the development of the rates during the week a Score difference of e.g. 3 may become more interesting than a Score difference of e.g. 5. There are many ways to follow the rate changes during the week. This can be done e.g. by looking at the charts of course and checking e.g. the Ichimoku and/or MACD in the Daily and 4 Hours chart. There are also many tools, apps and websites where the development of rates of currencies is shown in different automated ways. This may be by pips or percentage difference or by comparing the values of indicators like the RSI, Moving Averages, MACD, Ichimoku etc. 5. Because this is static information being published once a week the rates change constantly during the week. The mentioned scores also change and different opportunities may show up during the week. JPY, CAD, EUR and USD.